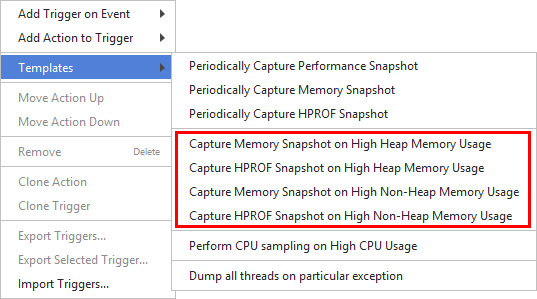 You can instruct the profiler to automatically capture memory snapshot when used memory reaches the specified threshold. When used memory constantly increases, this often means there's a memory leak. Based on this concept, this feature greatly simplifies the detection of such situations in e.g. long-running applications such as servers. One of the benefits is that, after being triggered, the feature requires no further human interaction. Please also consider the ability to dump memory on OutOfMemoryError. The JVM's internal lightweight dumping algorithm is used. This algorithm is specially designed to work in low memory conditions, when the JVM general purpose profiling interface JVMTI used by profilers may fail due to low resources. Then, if the threshold is reached, a memory snapshot will be created, a notification will be shown in the UI and the feature will deactivate. You can enable it again afterwards. Use startup option usedmem or usedmemhprof.